Selling owner-operated investment property can put you in a lot of uncomfortable situations. Not only did we often have to tour homes in severe states of disarray, some of them were in neighborhoods that went years without being recognized for their hospitality. In those instances, we were probably better off than most, as we were often a group of three or four guys, not really an ideal target for any scheming malefactors. Unfortunately, last week a man in Tampa robbed two real estate agents in the same day, with a handgun, in violent and frightening scenarios. Each time, he posed as a buyer, and police believe he’s made calls to a number of other agents, too. Very scary stuff. As of this writing, he remains at large. Thus, I thought it worthwhile to write about a few emergency alert apps. And in the interest of industry safety, these are already well-reviewed and proven. Just pick one. This company makes a few different emergency alert products for your smartphone, each applying to unique environments. One is for employees and educators in larger office and work situations, while another is targeted at college campuses. WatchMe 911 was designed for “working women and moms,” but clearly men can leverage its features, too. This app has a number of different ways for you to get help, and each uses a preprogrammed list of contacts and, when necessary, an automatic call to 911. 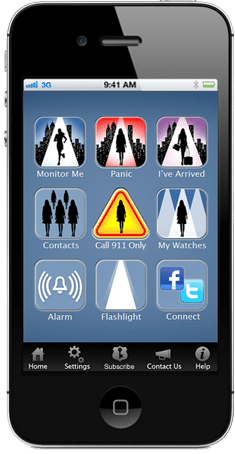 The Panic feature can be turned on if you’re feeling at all unsafe, and with two quick taps, your phone sounds an alert and 911 is dialed. The Monitor Me function uses a timer that, if not shut off before its culmination, will alert a list of emergency contacts, your selected “Safety Team,” to your whereabouts. This app is as simple as it gets. When launched, users are presented with a bold, green icon on which to place their thumb during any potentially unsafe situations. If, after removing your thumb, a PIN isn’t entered, police are alerted and dispatched to your location. When everything is fine, enter your PIN and carry on and sell the house. This isn’t an app. 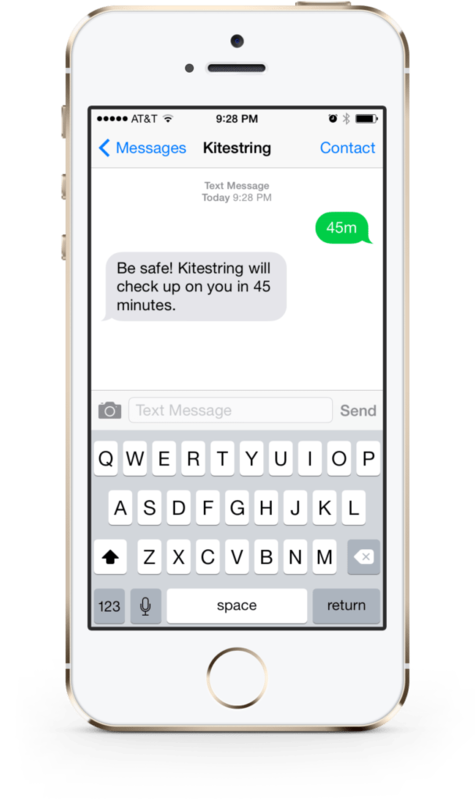 Rather, Kitestring is a text-based personal safety service. It also uses a timer method that asks users via text message if they’re OK after an arranged time. For example, when leaving to show a house, simply text “60m” to your custom Kitestring number. At the limit, you’ll get an automated “check-in” text. Respond positively, and the service cancels itself for that trip. If you don’t respond, a list of emergency contacts is notified about your situation. If everything is cool but you’ll be late, and still want Kitestring to stay connected, send an update of “20m” or “45m” to reset the alert. Like the vicious nature of people who want to leverage the independence of real estate agents against them, every personal alert app will have a drawback or two. The products here are purposefully simple so you can set them up and react with as little thought as possible. The timer systems are probably the most useful because if something happens suddenly, your phone gets stolen or deliberately destroyed, people will still be alerted. Please, continue to consider your safety when in the field, regardless of how critical it is that a listing sells. Be wary of showings at homes with “buyers” who seem hesitant to share personal information or who “just drove by.” It’s OK to be cynical sometimes. What personal safety apps — and what do you think? Leave a comment and let us know!